Speak Out is a board game produced by Hasbro. Players must wear a mouthpiece which does not let them close their mouth. Then, you must try and say different phrases. A timer counts down and while you say "he's my stealthy pet ferret named Garrett", others have to try and guess. Whoever gets it right keeps the card and whoever has the most cards by the end of the game wins. Speak Out is brilliant fun and every year becomes a best seller. You can usually find deals on ebay, Amazon and Toys R Us but be wary of buying online from third party sellers. It is known there are counterfeit versions of the game. It normally sells for £19.99 and a good deal will be about £12.50. 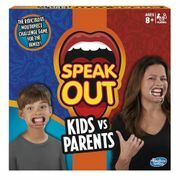 Hasbro Gaming Speak out Kids vs Parents Game - More Than HALF PRICE! 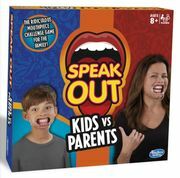 SPEAK out - Kids vs Parents Game £10.99 at Amazon **4.5 STARS** Hilarious Fun!! Speak Out Quick. Too Late! Out Of Stock! Hasbro Speak Out Game - in stock! SOLD OUT IN A FEW HOURS. Speak Out Game at Tesco Hurry! Hurry! 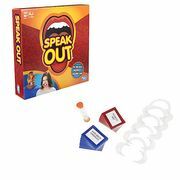 Speak Out game back in stock - be quick! Hasbro Speak Out back in Stock and money off!